She's still there - Frightened little fur baby looks scared to death who could blame her? Can anyone help with finding a rescue for this frightened little fur baby?. She's rescue only and code red. 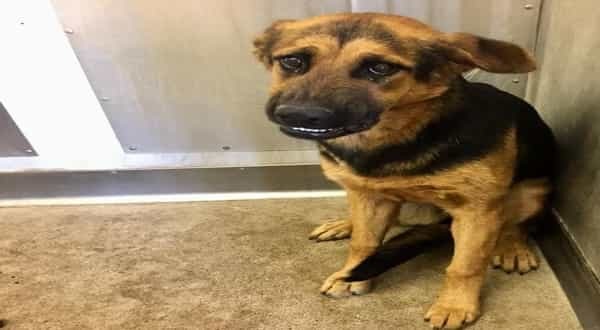 She doesn't deserve a death sentence she deserves a loving home someone find it in your heart to save this scared baby. I just called and she's still there. They said she's available for adoption but is very afraid, not sure if she would get along with my dog. I can get her out if someone is willing to foster her and pay adoption fees. Stacey is a young , female, poorly , treated skinny German Shepherd mix . 1 Response to "She's still there - Frightened little fur baby looks scared to death who could blame her?" I HAVE SENT HER PHOTO TO A RESCUE ORG. PLEASE GIVE HER TIME TO GET OUT. YOU SHOULD BE SOCIALIZING HER.